We have put together a primer on how to write a college resume to help you know exactly what to say to land the job you want! For job seekers who are still in college or have recently graduated, it can be difficult to find enough information to include on your resume to make it stand out and get a prospective employer’s attention. Your resume needs to take your skills, education and experience and make the employer take notice. Education: Your college education information is the most obvious aspect of your college resume. Make sure you include your degree program and any relevant or outstanding courses that other graduates of the same program might not have taken. Also include any academic awards or honors you received for your coursework. Experience: List any relevant work experience that you have on your college resume. Ensure that it is relevant to the job you are trying to get – if you include non-relevant work experience, the employer is more likely to toss your resume in the trash. You can also put a well-worded sentence or two about each job, to list your duties and how they relate to the job that you are applying for. Activities & Memberships: Use this section to showcase your relevant activities and professional or organizational memberships that apply to the job you are going after. 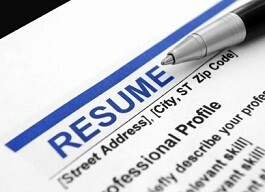 These entries are just as important on a college resume as they are on other types of resumes. They also let the employer know that you are willing to go above and beyond the minimum required to better yourself and make a positive impact on others. If you don’t hold any professional memberships, look up the local or state-sanctioned professional organization for your career field and inquire about a college or student membership. These memberships are usually offered free of charge or at a very reduced cost, and offer a vast number of benefits to members. Skills: It helps to include a brief list of the relevant skills that you have acquired on your college resume. This helps the employer determine if you are a good fit for the job. Don’t overdo it, and only list skills that would be beneficial in the job you are applying for. Contact us today by phone at (978) 921-5600 or by email at CustomerSupport@GoGetterCareers.com and let us help you get started on the search for that perfect job! If you are a current college student or have recently graduated, you don’t have to go through the job search alone. GoGetterCareers.com can help. We offer a huge variety of services to job seekers that include resume assistance and our services can help you write a college resume. We can connect you with professional resume writers who can create a college resume from scratch, or improve upon a resume that you already have.